For help accessing the Members Only page email iiscadmin@iisc.org. As a member, you will be informed of existing, new, and changing regulations. 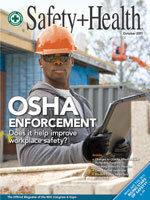 In addition to IISC's electronic newsletters and updates, publications are available from the National Safety Council. These publications are either free as part of your joint membership or available at a member discount. Click HERE for additional information on NSC publications.